By sharing their love of reading, this Vancouver crew are bringing their community closer together. Now age 46 and a parent to two teens—Alicia, 15, and Christopher, 13—Cao can’t help but lament that city neighbourhoods aren’t as tight-knit as they were when he was growing up. So he and his family are doing their part to create closer connections within their community, by operating a local book exchange. It all started when Cao, his wife Pei-Ti Hsu and their kids attended a WE Care Vancouver workshop this past summer and learned the basic formula of “gift + issue = change.” They already had an issue they cared about—community engagement—but when they paired it with their shared passion of reading, their action plan took shape. “We’re big readers. The kids started with Harry Potter and Percy Jackson, and have moved on to more mature fantasy and mythology novels,” says Cao. 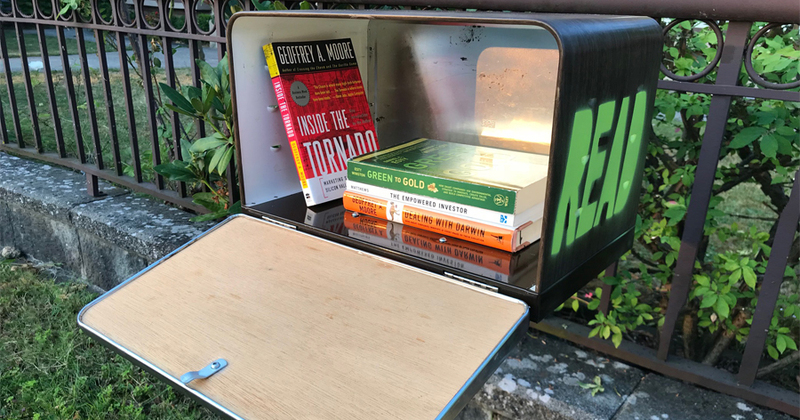 “So we thought, how about if we share some of our books with our neighbours to provide a conversation starter and create a greater community feel?” The family decided to build a little “library” outside their house—like an oversize mailbox to store the books and keep them safe from Vancouver’s notorious rain. To maximize the lessons they’d learn about action planning, Cao tasked his kids with finding ways to finance the endeavour outside of the bank of Mom and Dad. They found the materials they needed—a breadbox and a metal table stand—for free on Craigslist. They set up the little library just outside their house with a sign that says “Book Exchange: Take a Book, Leave a Book” and waited to see what would happen. The book exchange is just the latest community project for the Caos family, who have always believed in the importance of altruism, volunteerism and giving back. Alicia, for example, helps with the church soup kitchen every Saturday at 6 a.m. (“For a teenager to wake up at 5 a.m. on the weekend is no small feat,” quips Cao), and Christopher volunteers at fundraisers and holiday events at the local community centre.